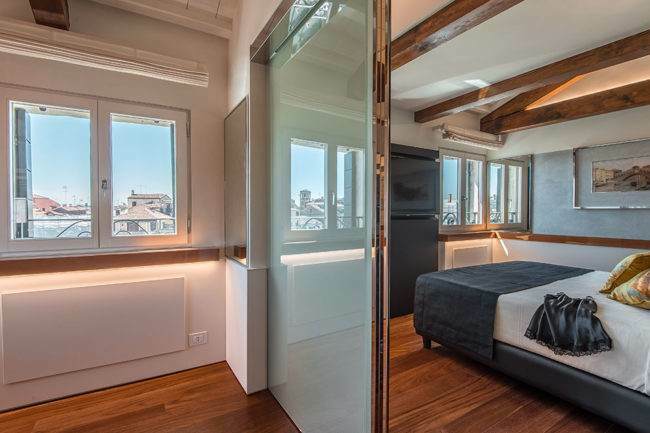 Rialto Luxury Studios offers exclusive holiday apartments in Venice featuring luxury furnishings; some with spectacular views of the Rialto Bridge. 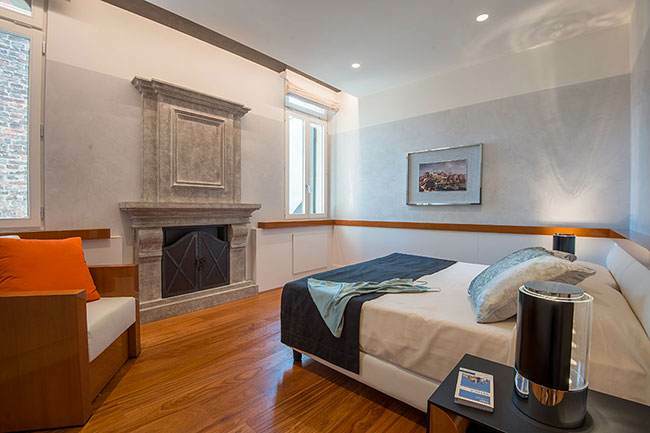 Our luxury apartments are ideal for a romantic stay in Venice: all are situated on the top floor of a noble palace overlooking the Rialto Bridge and Grand Canal. 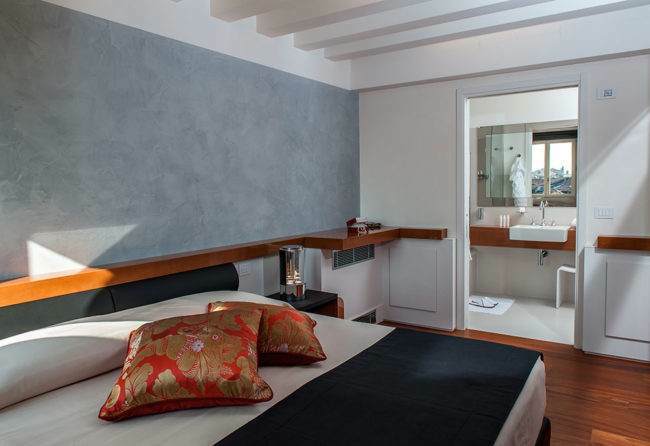 A lovely setting from which to enjoy the magic that only a holiday in a Venice apartment can offer. 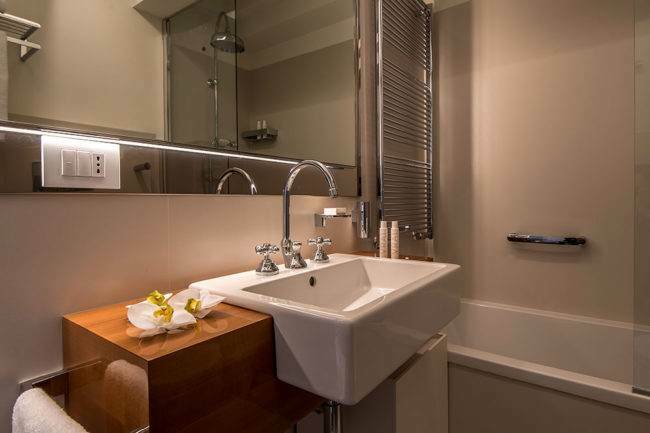 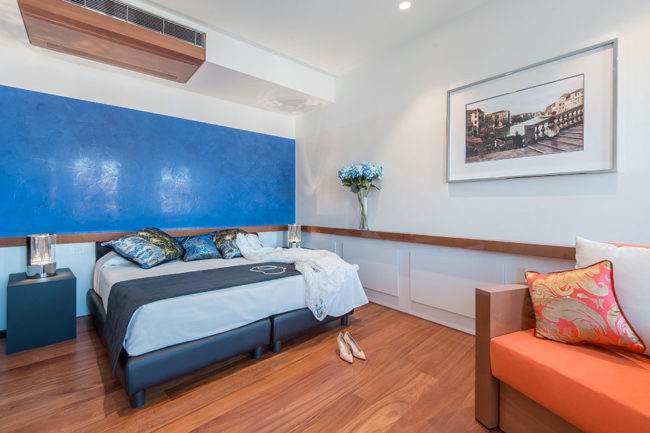 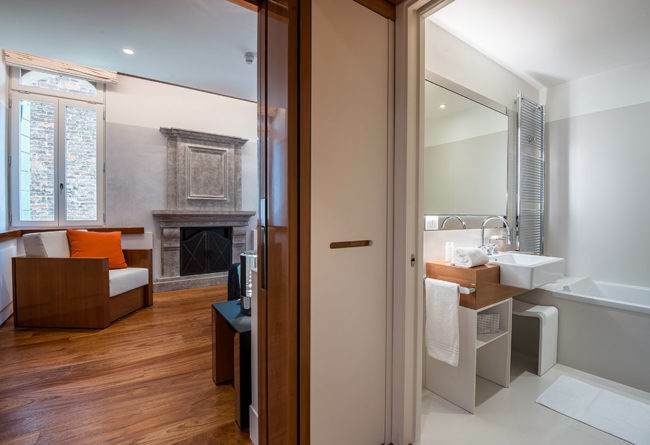 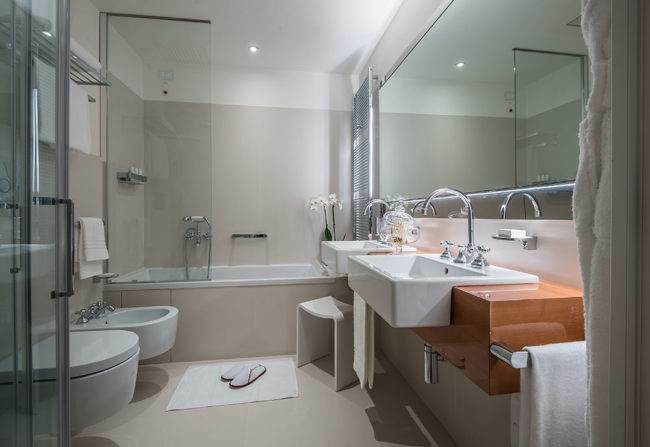 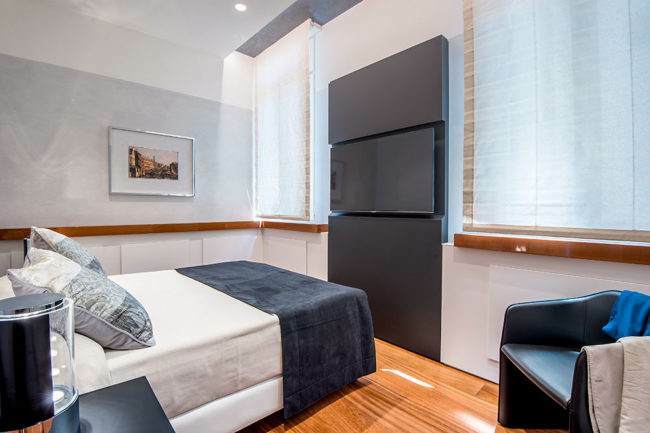 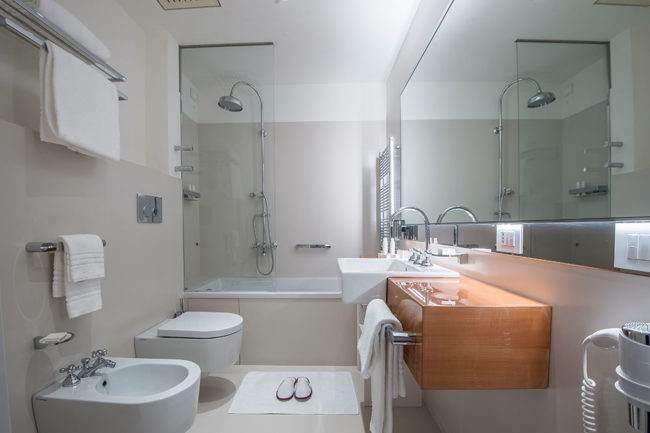 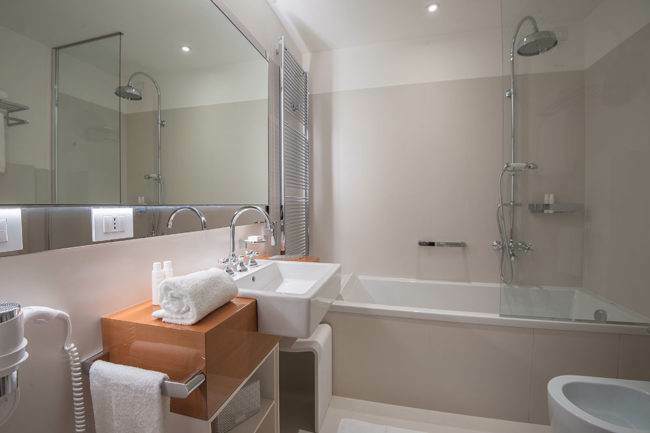 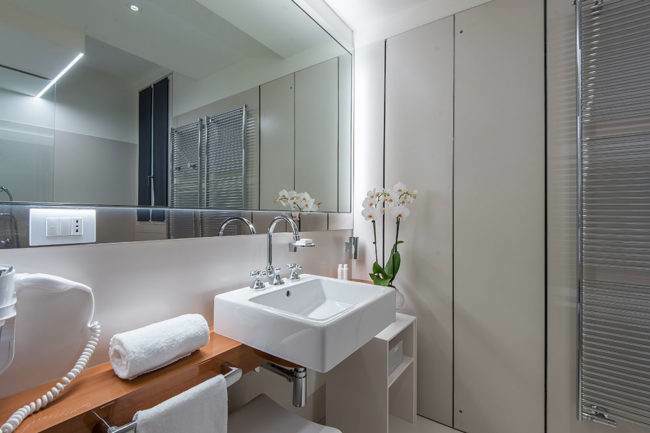 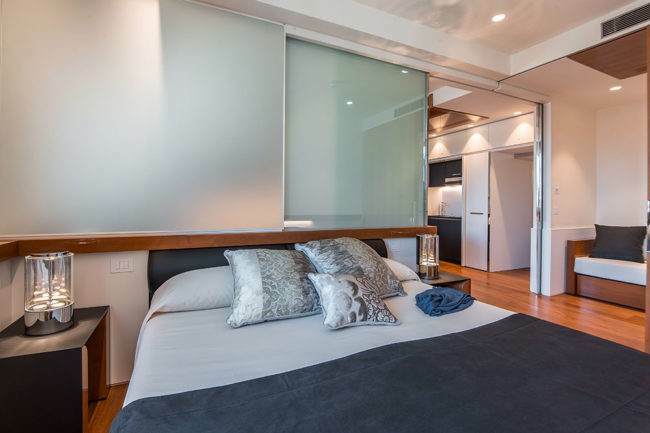 With elegant contemporary furnishings, the holiday apartments Venice feature luxurious decor and details, for a warm and relaxing atmosphere that is ideal for a romantic stay in Venice. 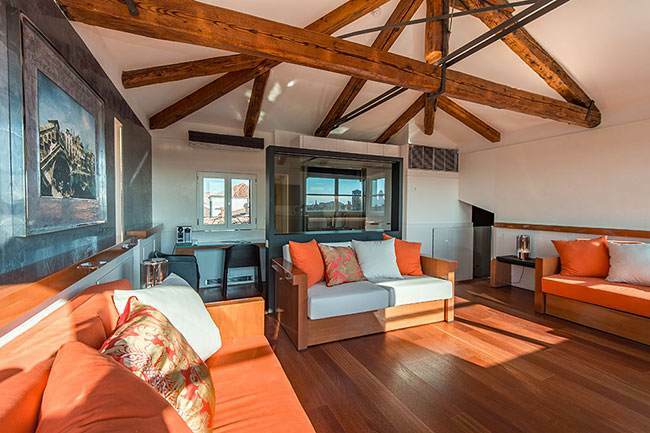 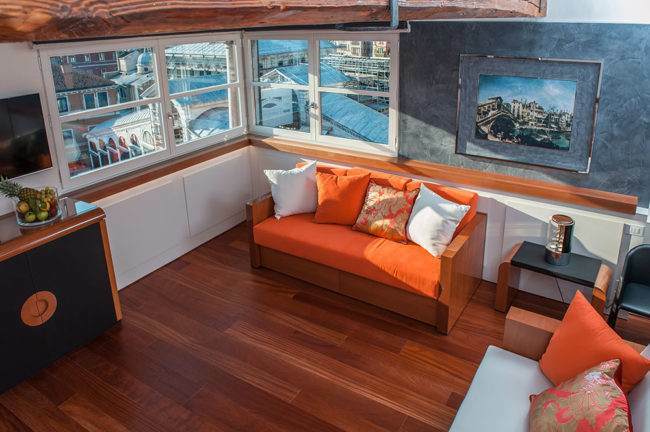 For a truly unique experience, opt for the luxury rooftop apartment. 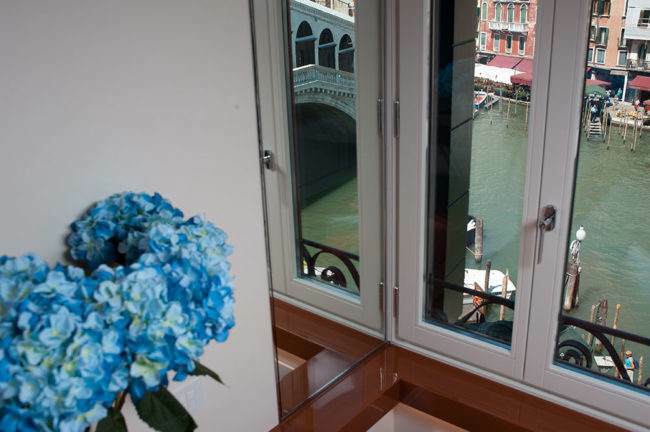 Panoramic windows allow for spectacular views overlooking the Rialto Bridge and the Grand Canal. 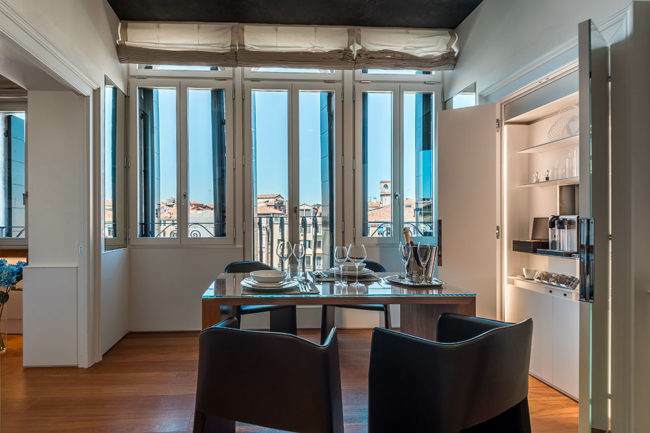 The view from the apartment provides an enthralling setting that changes as the day progresses, right until sunset, when Venice is even more beautiful and romantic! 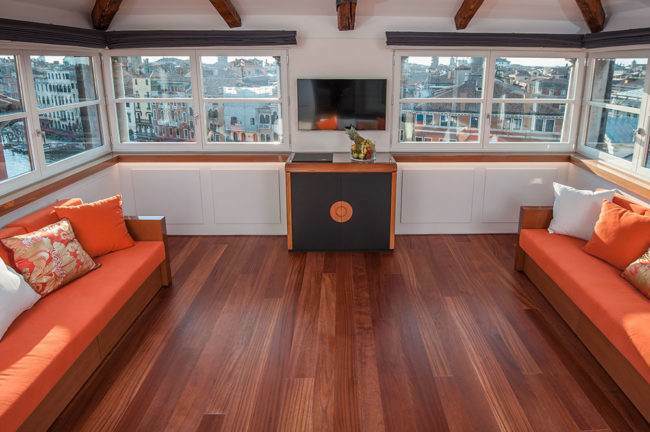 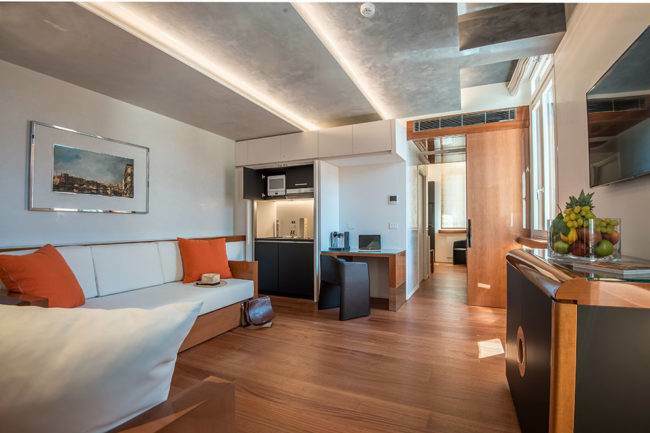 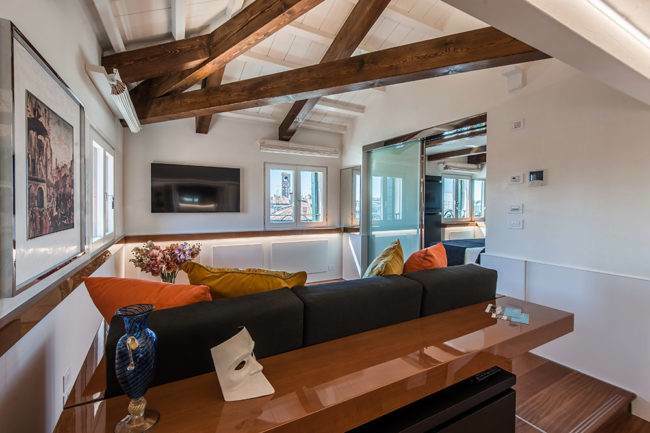 The luxurious Studio Attico rooftop apartment is the most spacious and also the most popular with guests, so hurry and guarantee your booking for a unique experience in Venice. 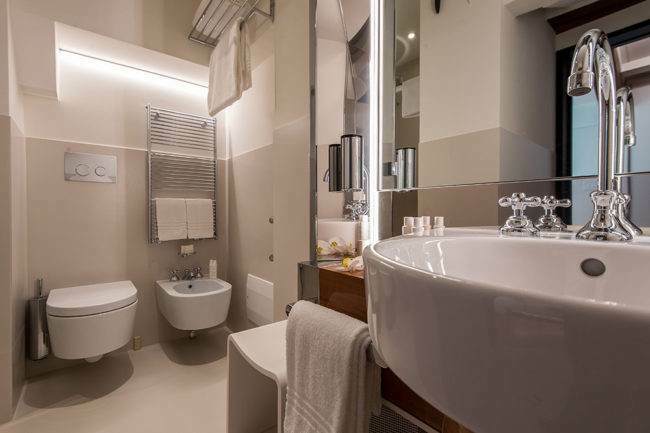 Features and amenities: Apartment for two persons, 79 sq.m, living room with kitchenette, bedroom, bathroom with shower. 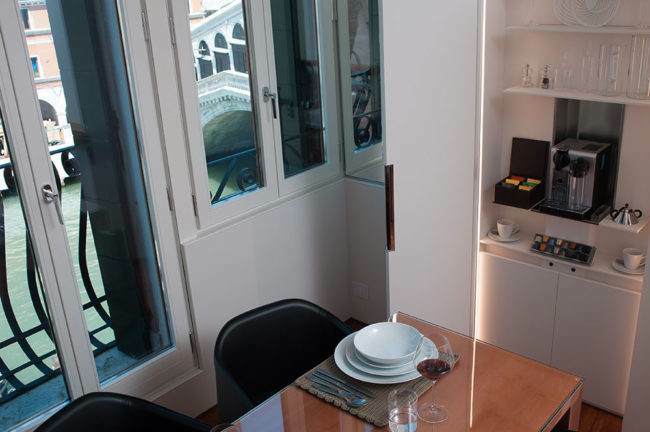 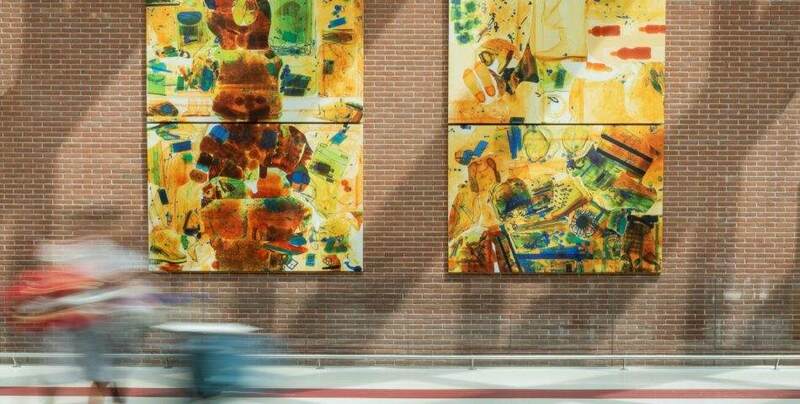 Enjoy a truly exciting setting from the studio apartments overlooking the Rialto Bridge and Grand Canal. 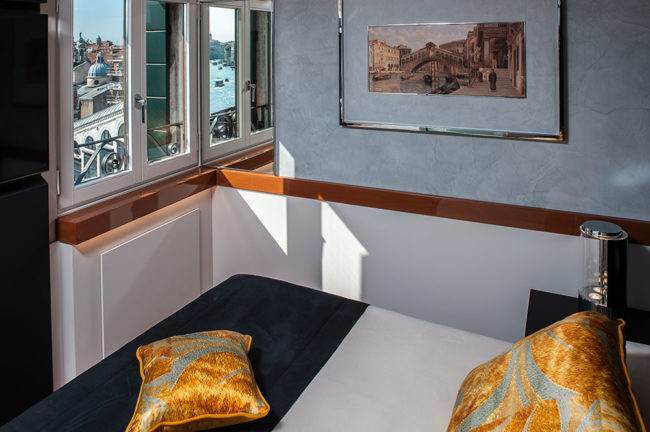 The Grand Canal stretches out before your eyes, punctuated by the Rialto Bridge, picturesque shops and the continuous comings and goings of gondolas and boats on the waters of the world's most famous canal. 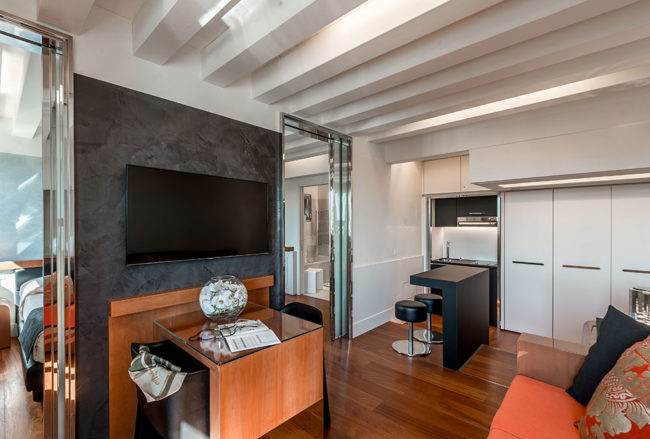 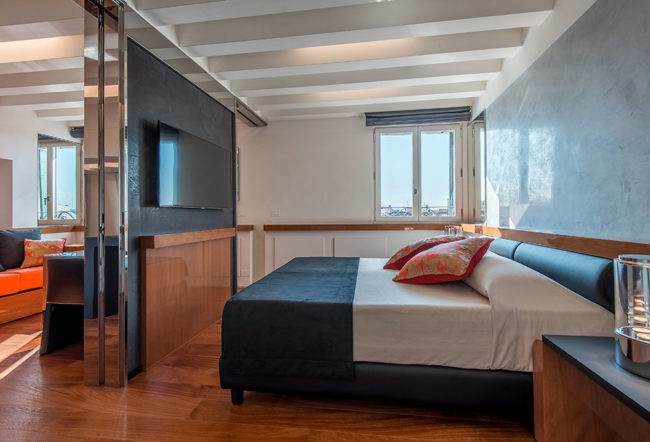 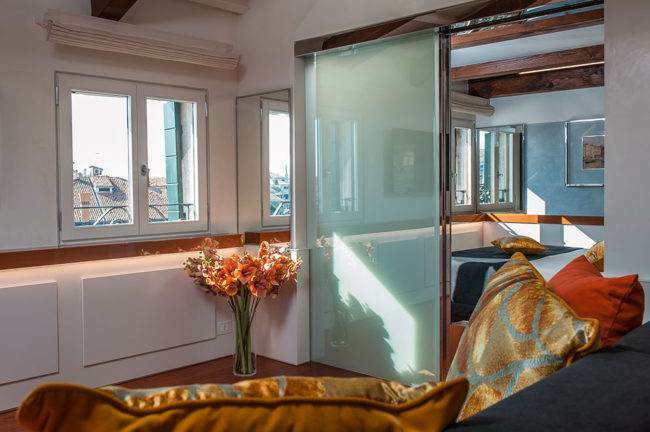 Equipped with the most modern amenities and services, the luxury apartments with a view offer ideal accommodations for a romantic break for couples in Venice. 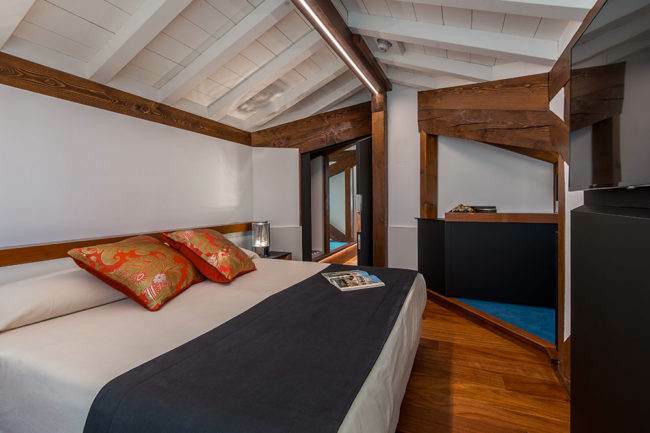 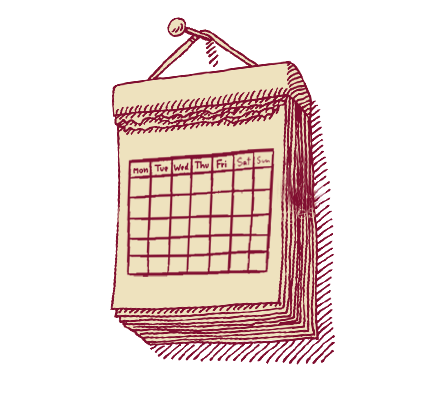 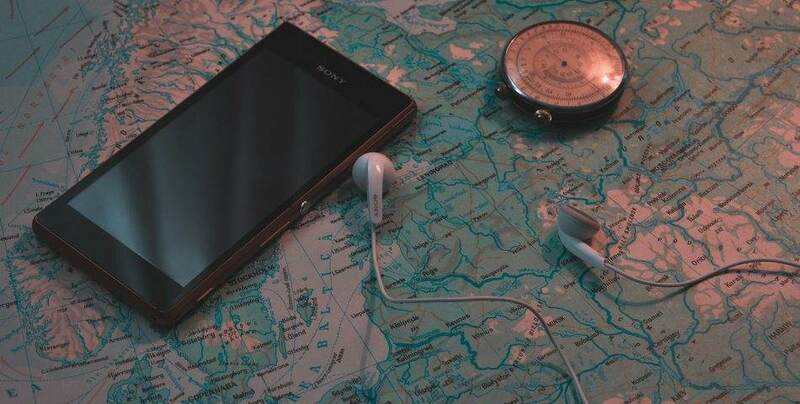 Book now to benefit from the best online rate! 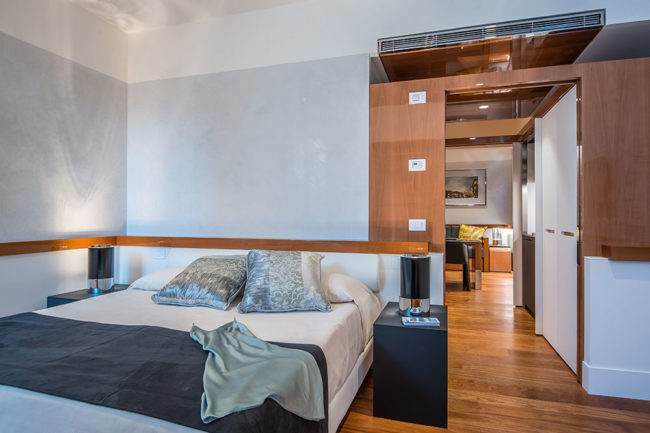 Details and features: apartments for two persons, from 46 to 59 sq.m, including a living room with kitchenette space, bedroom and bathroom. 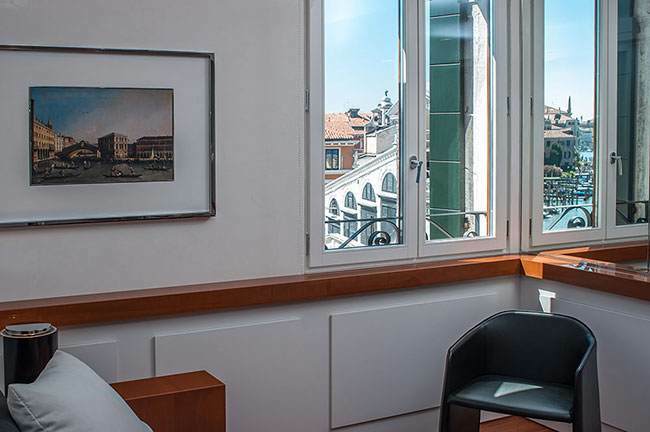 Comfortable, luxurious holiday apartments Venice, overlooking the street below, featuring full amenities: what more can you ask for a romantic getaway in the world's most beautiful city? 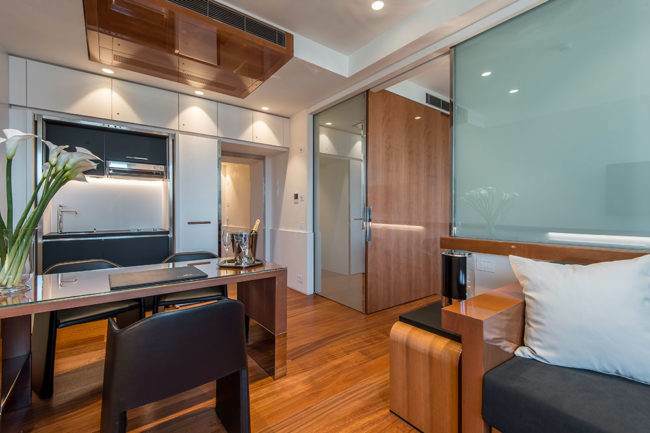 Book now to fall in love with your better half in a luxury apartment. 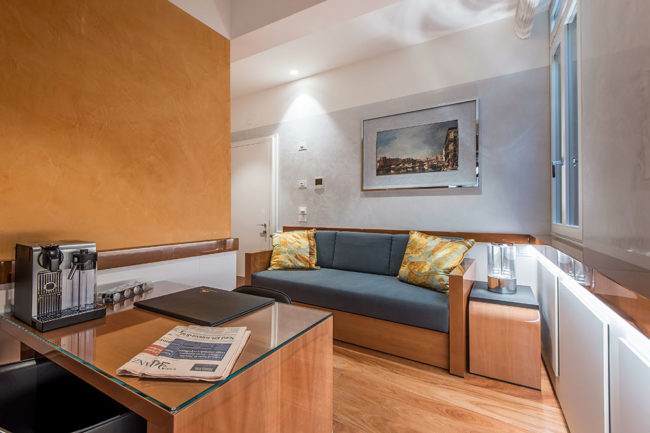 Details and features: apartments for two persons, 47 sq.m, including a living room with kitchenette space, bedroom and bathroom.